I love biscotti especially with a ridiculously expensive cup of coffee but until now I have never tried to bake them.”Biscotti” is the plural form of biscotto. The word originates from the medieval Latin word biscoctus, meaning “twice-cooked/baked.” (as quoted byWikipedia). I think it is this twice baked method that has put me off. As I have mentioned before, I have long-standing love affair with biscuits and biscotti is no exception so I bit the bullet and had a go at making them. 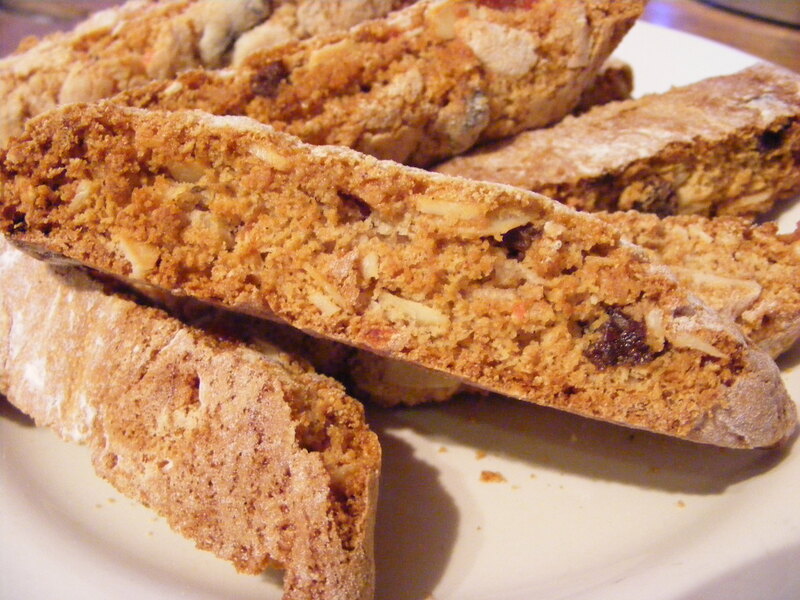 The recipe that I adapted for these biscotti came from the Good Food Guide and was called Christmas Biscotti. Now when it comes to Christmas, most families have their own little traditions such as everyone sitting down together to watch the Queen’s speech at 3 o’clock or having a slice of pork pie and a sherry for breakfast (yes, thank you, Su, for that one!). Ours, not surprisingly, involved biscuits. Ben and I have been on our own for over 13 years now and when he was little we would load up the car on Christmas eve and do the 3 hour journey down from North Wales to Worcester to spend Christmas day with my family. Then we would do the reverse journey on Boxing day so that Ben could spend the week between Christmas and New Year with his dad in Liverpool. This went on for several years until eventually Ben and I decided that we wanted to spend Christmas day at home together, where he could make as much noise as he wanted and could play with his toys (nowadays it is his X-box!) and we could just relax. We now have our own little traditions. We buy each other new pyjamas which we wear all Christmas day because it is the only day of the year when we don’t have to go out and no-one visits! We are both allowed to open one small present on Christmas eve but only one. This was to stop Ben spontaneously combusting as a small child from sheer excitement! And we always have freshly baked cookies for breakfast and served with an ice-cold glass of milk. I am sure in the next few years this is all set to change. Ben has growing up fast. At 15 he towers above me and I am fast learning that just because I think something is a good idea, it doesn’t mean to say that Ben thinks the same! He is a young man with his own mind who is not afraid to share this opinions and thoughts. My little boy is almost a young man. That is a frightening thought in itself! The one thing that I can depend on not changing, however, is our Christmas morning cookies since Ben has already asked if we can have my chocolate chip cookies this year. Having seen how easy these biscotti are to make I think that these get my vote for Christmas Morning Biscotti too. They are so much better than Starbucks! These look really good and I am going to give them a try, and have them with my champagne for Christmas morn. Our tradition is smoked salmon and champagne, but adding a little biscotti sounds really good! Give them a go! They are so easy to make and taste gorgeous! I’m going to have a play with the basic recipe and see what variations I can come up with. Enjoy them!